MEANING OF NAME: Name was given to her by Sabah Wildlife Department officer who sent her to BSBCC. HISTORY: Wawa came to BSBCC on the 18th of March 2016. She was found in the Forest Management Unit (FMU) 16, Pinangah, Telupid District on the 11th of March 2016, alone without her mother and appearing weak. Wawa was brought to the main office of the unit and decided it would be best to only give her some water to drink. They surrendered the cub to the Sabah Wildlife Department and she was sent directly to the Lok Kawi Wildlife Zoo before being sent to BSBCC. She weighed 4.5 kg on arrival and showed signs of dehydration. PERSONALITY: Wawa has a sweet nature with blue eyes. 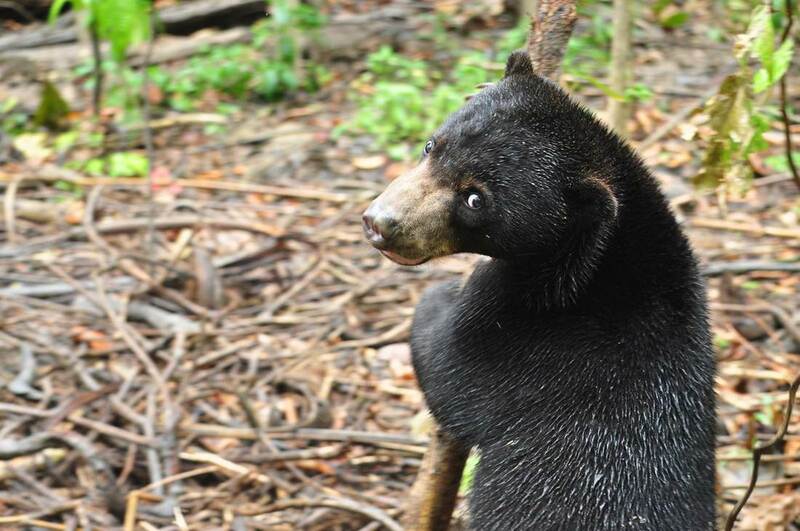 Like most sun bear cubs, she has essentially captured the hearts of everyone. She moved to the bear house with Dodop on October 10th, 2016. After that, she was integrated with the sub-adult group. Though, Wawa still loves Dodop the most. She always tries to find Dodop when she is gone from her eye sight. Wawa is very alert with the environment. She will give a warning bark when a stranger is getting close to her. Wawa loves to explore in the forest canopy. She enjoys resting on hammocks. Now, she spends more time learning pertinent skills in the forest. We know that her time will come to take the next step in her journey to freedom and to slowly put her past behind her. ADOPTION: Natural Habitat Adventures is adopting Wawa under the My Bear Adoption Programme.